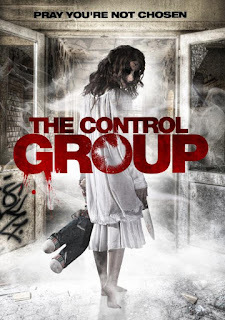 Five college students get drugged at a party and wake up locked in an abandoned insane asylum where they are used as test subjects by an elite team headed up by a power hungry crazed scientist. One by one, under observation from the team, the students are killed off by various means; preferred method seems to be electrocution. One of the students is onto them though and has help from a friendly supernatural force. This is extreme low budget and shows in every way. It does however feature seasoned professional Brad Dourif as Dr. Broward who is really the only good thing about this movie; he puts in a sound performance with the script given. Unfortunately the same cannot be said of the rest of the cast as their acting is pretty awful, although I did quite like the hippy dreamy character of Jaime played by Kodi Saint Angelo. I think the casting directors were way off at times casting people who looked obviously in their late thirties as students and the actress cast as Anne, the ghost of a child, was pushing the boundaries as it too was glaringly obvious she was not a child but she did have the most obnoxious childish voice so I guess with their budget beggars can’t be choosers. I found this movie quite confusing and convoluted with really bad dialogue and overly ambitious storylines that were unobtainable within the budget they had. It feels like there is a lot going on and it jumps about in time a bit but really it is nothing special, the soundtrack is alright and I quite enjoyed the SPFX, however this is not enough for me to rate it highly at all. I’m not saying don’t watch it, if low budget shockers are your thing then go for it but it barely scrapes through with 2 stars in my opinion.